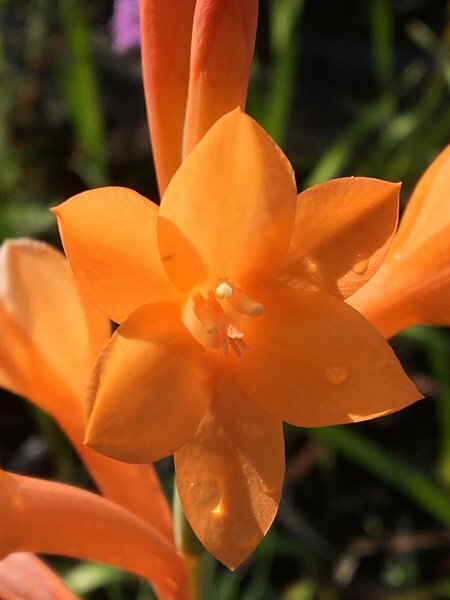 A proudly South African species, this impressive, robust, perennial geophyte has lovely, waxen green, acicular, firmly upright leaves and ornate flower spikes that support more than 30 elegantly curved, tubular, bright apricot-orange blossoms that carry copious amounts of sweet, syrupy nectar. The stately Bugle Lily has been intensely hybridised, and currently an array of glorious colours can be found across the globe. 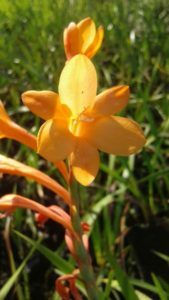 This species honours the late Neville Pillans (1884–1964), an avid botanist, who worked at the Bolus Herbarium, the oldest functioning herbarium in South Africa, for more than 30 years. A most rewarding, easily cultivated garden plant. Iridaceae – The Iris family. This species is most widespread in grasslands of the summer rainfall areas of South Africa, particularly the easternmost parts, from just above sea level to fairly high altitudes (± 2000 m). 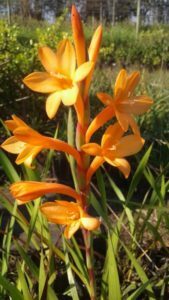 It can also be found growing in very sandy soils near the coast and on rocky outcrops as well as on the various mountain ranges of the Cape provinces. The largest populations can be found in the southern parts of the Western Cape, extending to the Eastern Cape, Mpumalanga and Natal, where it often forms voluminous colonies. It has a somewhat flattened, underground corm (rootstock) covered with a protective, densely fibrous greyish-brown membrane. This corm typically measures 25 – 50 mm in diameter. The stem is generally bare, but on some specimens up to 3 petite, upright branches can be observed. The leaves are a lovely pale green, rigid, firm, erectly held and long (10-18 mm wide), with smooth, slightly translucent, pale-yellow margins. There are typically 3 – 4 leaves, arising from the base of the plant. They are spear-like to almost rectilinear in shape, narrowly triangular, slightly twisted, with sharply pointed, dry tips. The inflorescence is an elongated, robust branched stem carrying up to 35 tubular flowers. Colouration is varied; from bright apricot orange or salmon orange red to pink, with bright orange being the most common. The flowers themselves have slender, elongated, slightly curved tubes that widen at the mouths, becoming nearly cylindrical, giving them a funnel-like shape. The flowers are 50 – 80 mm long, 20-35 mm wide at the base, 40-60 mm wide at the mouth, with about 6 widely spreading, slim, ± equal lobes and several small basal, dry tipped, reddish-green bracts. The fruits are in the form of inversely ovoid to nearly rounded capsules (10-12 mm). Each such capsule contains several oblong, lightweight seeds that are equipped with compact wings that assist with wind dispersal. Take care when handling these plants, especially the underground bulb, as it may cause skin irritation. W. pillansii resents being moved or transplanted once it has settled and doing so may adversely affect growth and flowering. The flowers are perfectly designed to cater for the needs of nectivorous bird species, and also produce copious amounts of nectar, albeit they are unscented. The flower stems are also sturdy enough to allow the birds to perch with ease. Butterflies and certain insects will surely also visit the blooms, and these may in their turn lure insectivorous birds. The beautiful Bugle Lily is a clump-forming, evergreen perennial that grows into lovely, leafy clusters that remain fresh and appealing all year round. 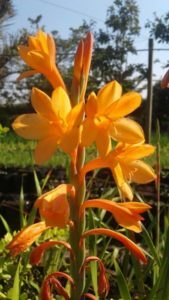 It is very low-maintenance and is easy to care for, requiring little to no special attention and is not fussy with regard to soil type. Its natural predisposition of forming densely spreading clusters makes it a very good choice for soil retention and retaining soils. It makes a most handsome addition to rock gardens and can be grown easily in warm, exposed and very sandy areas. 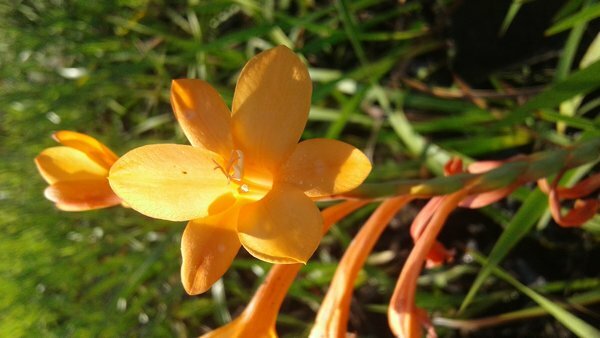 It grows in difficult coastal areas. 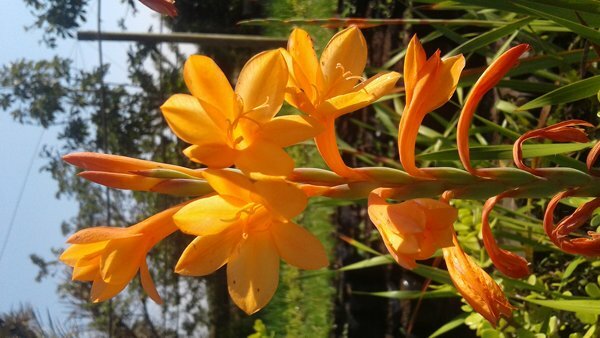 perfect choice for mass planting, makes a lovely, long-lasting cut flower and grows well in a container. Attracts birds to the garden. As they are well-suited to winter rainfall areas, and they can store moisture in their underground corm, they are able to withstand the occasional summer dry spell, although they prefer to be kept moist. If left without water for too long, they enter a dry dormant phase. The leaves are tender to frost damage but the plant itself can easily re-sprout after severe colds (up to -4°C). It can however be severely damaged or even killed by prolonged, extremely cold conditions. In areas that are known to experience sudden (early) frosts or severe cold spells, it is advisable to cover the surrounding soil with a dry mulch, which will help with insulation and water-retention. The plants should also be planted in a sheltered, sunny location or against a protective wall. 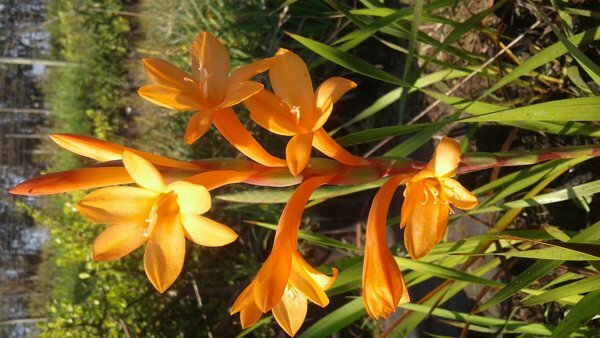 Pillan’s Watsonia can grow in difficult coastal environments with apparent ease and is also able to survive rapid veld fires. These plants have a fairly rapid growth rate of between a 100 – 150 mm per year, depending on the environment. They will typically start producing flowers after about 1.5 – 4 years, depending on individual conditions. Although they can grow in semi-shady conditions, full sun is best. If they receive insufficient sunlight, flowering may be negatively affected or retarded, and the leaves seem to be more susceptible to rust attack and pests. W. pillansii grows best in a moist but well-drained, humus rich soil, and will benefit from a bit of added fertiliser during the active growing months (spring and mid-summer). It is adaptable to a variety of soil types and grows equally well in sandy, loamy, clay or chalk soils, tolerating an acidic, alkaline or neutral ph. It prefers a near constant supply of water throughout the year, but more should be given in areas where or when the summers are very hot and dry. Propagation can be done by means of seed or corm division. If propagating from seed, sow them in late winter or early spring. Place the seeds in relatively deep trays filled with an airy, well-drained mixture of fine washed river sand and compost (2:1). Place the trays in a temperate and brightly lit area and keep the soil moist but do not let it become overly waterlogged. To prevent mildew setting in, the seeds can be treated with a pre- or post-emergence fungicide. Germination typically occurs within 2-4 weeks. Do not disturb the seedlings for at least two actively growing seasons. If propagating from corm division, it is advisable to start this process well before the active summer growing season. Remove and use only the most current, highest corm (there should be several stacked-on top of each other). Remove some (not all) of the old leaves and plant this corm immediately; do not let it become desiccated.